2018 Tournament of Roses parade (Pasadena, CA) Queen's Trophy. "Most effective use and display of roses in concept, design and presentation." 2016 Tournament of Roses parade (Pasadena, CA) Queen's Trophy. The Pasadena Tournament of Roses Association, created by the efforts of Charles Frederick Holder and Francis F. Rowland, is the non-profit organization that has annually produced the New Year's Day Rose Parade since 1890 and the Rose Bowl since 1902. "America's New Year Celebration" is "a festival of flowers, music and equestrians and sports unequaled anywhere in the world", according to the Association. The association has 935 volunteer members and the members spend some 80,000 combined work-hours to stage the events. The year 2016-17 marks the 128th Rose Parade and 103rd Rose Bowl Game on January 1, 2017. It's like a romantic scene out of one of South Korea's sappy soap dramas -- tens of thousands of illuminated roses forming an impressive backdrop for the lead actor and actress to declare their love for each other. The Light Rose Garden, a public art installation featuring a sea of white roses made with light-emitting diode, or LED, is also a perfect venue for Valentine's Day in Hong Kong. Originating in South Korea, the Light Rose Garden is on a world tour with its first stop in the southern Chinese city. Organizer Jung Yong Jin said he's thrilled to see people outside of Seoul enjoying the garden, made up of 25,000 waterproof white roses arranged tightly in Hong Kong's landmark Central and Western District Promenade, with 25 roses planted every 3 square yards. The roses light up each night and instantly illuminate the park against the backdrop of Hong Kong's skyline. Couples, families and friends flock to take photos. "I created this LED rose garden because I wanted families, friends and lovers to come out to parks at night," Jung said. A woman from Taiwan, who was visiting with her boyfriend, said the romantic setting reminded her of Korean dramas. "I don't feel anything," the boyfriend, who identified himself only as Lee, laughed. "She showed me those scenes. Korean dramas are like that. So when I read about it, I wanted to bring her here." For Valentine's, he gave her roses made of Lego bricks. © 2016 FOX News Network, LLC. Photo © Reuters. A pre-Valentine display in Essen, Germany. PBS' float "Downton Abbey: The Final Adventure". The Pasadena Tournament of Roses Association, created by the efforts of Charles Frederick Holder and Francis F. Rowland, is the non-profit organization that has annually produced the New Year's Day Rose Parade since 1890 and the Rose Bowl since 1902. "America's New Year Celebration" is "a festival of flowers, music and equestrians and sports unequaled anywhere in the world", according to the Association. The association has 935 volunteer members and the members spend some 80,000 combined work-hours to stage the events. The year 2015-16 marks the 127th Rose Parade and 102nd Rose Bowl Game on January 1, 2016. Messier 17: Could a massive cosmic rose smell as sweet by any other name? "A rose by any other name would smell as sweet," said Shakespeare's Juliet. Does that still apply if the rose is a giant cloud of gas and dust? Officially named Messier 17, this spectacular nebula is now visible in stunning relief in a newly released photo from the European Southern Observatory's La Silla telescope in Chile. The rose-hued stellar nursery has earned many colorful nicknames, including the Omega Nebula, the Checkmark Nebula, the Horseshoe Nebula, the Lobster Nebula, and the Swan Nebula. Whatever you call it, Messier 17 remains a gigantic hotbed of star-birth - one of the youngest and most active in our galaxy. Astronomers have counted nearly 800 young stars emerging in its center, with even more stars scattered across the whole nebula. You can see Messier 17 in the constellation Sagittarius (The Archer), where the cosmic rose stands out as particularly bright against one of the darker regions of the Milky Way. It stretches 15 light years across and its gas has more than 30,000 times the mass of the Sun, astronomers estimate. What gives this stellar nursery, located 5,500 light-years from Earth, its rosy hue? Glowing hydrogen gas. Infant stars emit ultraviolet light that excites the hydrogen gas around them. That excited gas radiates in the pink to red wavelengths, bright enough to catch astronomers' eyes. Messier 17's official name comes from Charles Messier, a French astronomer who searched the sky for comets. As he hunted, Mr. Messier also noted the locations of bright celestial objects that were not comets, so he wouldn't be confused. He numbered the radiant objects in his published astronomical catalog in 1764. But Messier wasn't the first to spot the spectacular rosy nebula. Swiss astronomer Jean-Philippe Loys de Chéseaux had found the cosmic rose around 1745, but his work was not widely publicized, so when Messier independently discovered the same nebula later, the Frenchman received the credit. Messier 17's many nicknames come from its appearance, which reminds some of the Greek letter omega, while to others it looks like a swan, a horseshoe, or a lobster. The glow of this vast celestial rose is interrupted by darker spots and webs, caused by dust that blocks the light from the excited hydrogen gas. Increasingly powerful telescopes have allowed astronomers to see more and more colors hidden in the nebula. When the ESO took a close-up six years ago, astronomers described a "fascinating palette of subtle color shades across the image," caused by "different gases (mostly hydrogen, but also oxygen, nitrogen and sulphur) that are glowing under the fierce ultraviolet light radiated by the hot young stars." The Kumari of Tokha, nine-year-old Dangol, became a living goddess as an infant. A kumari's eyes are believed to draw the beholder into direct contact with the divine. For religious festivals her forehead is painted red, a sign of creative energy. This image of a pair of interacting galaxies called Arp 273 was taken by the NASA/ESA Hubble Space Telescope and is the perfect Valentine's rose for the rose loving astronomer in your life! Other kinds of roses "grow" on people. The many rose designs are women's favorite tattoos. Go here to see more. This little fellow is trying to attract a froggy lady fair. From the Pictify web site of Susan Liston. Pink roses await placement on a float for the 2014 Pasadena CA Rose Parade on January 1. By Sumitra on February 16th, 2012. This is just the stuff that fairytales are made of. The beautiful princess walks off into the sunset with her prince charming, dressed in a gown made from thousands of red roses. You’d never think it could happen in real life, but it has. In an incredibly romantic gesture, this guy in China had a dress made of 9,999 deep red roses for his girlfriend. After she put on the dress, he proposed. Initially Xiao Fan considered proposing with only the roses, but realizing his girlfriend’s love for fashion, he decided to go a step further and get them sewn onto a dress. So the flowers were stitched together carefully to make a sweeping floral gown, fit for a bride. Several dressmakers worked round the clock on the project to get it completed on time. I think it’s pretty amazing how they managed it, keeping the flowers so fresh and lovely. Yin Mi, the lucky girlfriend, had the gown adjusted on her on the day of the proposal. On top of the rose gown, she wore an ivory-white fur shrug and also held a bouquet of yellow orchids. The event took place on the grounds of Chime-Long Paradise amusement park in Guangdong province. The place was chosen because that’s where the happy couple met for the first time, when Yin Mi was crowned Miss Bikini 2009. The dress that Mr. Fan had made is not just breathtaking, but also pretty symbolic. The number 9 in Chinese culture is said to represent ‘forever’. The orchids are known to symbolize love, beauty and virtue. Mr. Fan has obviously won top brownie points from his girlfriend, seeing that she happily accepted his proposal. But I do think he’s set some pretty high expectations with her as far as romance is concerned, and he’s going to have to live up to them all his life! This all seems very original, doesn’t it? Only Xiao Fan isn’t the first to use thousands of roses to propose to the love of his life. Back in 2009, we posted about another Chinese romantic who used 9,999 roses and a lot of friends to ask his girlfriend to marry him. I have to hand it to Chinese men, they know how to make a great impression. Massed roses at the 2012 Chelsea Flower Show put on by the Royal Horticultural Society (RHS) in London, England. The RHS Chelsea Flower Show, formally known as the Great Spring Show, is a garden show held for five days in May by the Royal Horticultural Society in the grounds of the Royal Hospital Chelsea in Chelsea, London. The show is the most famous flower show in the United Kingdom, perhaps the world attracting visitors from all over the world. Highlights to the Chelsea Flower Show include the avant-garde show gardens designed by leading names with Floral Marquee at the centrepiece. The Show also features smaller garden such as the Artisan and Urban Gardens. Rose petals being dried in Lahore, Pakistan. Flower wholesalers spread hundreds of thousands of roses on a road underneath the baking sun to dry them before supplying the flowers to the market. The Roses, Park Avenue (57th-65th Streets), New York City. Thirty-eight of Will Ryman's larger-than-life rose sculptures grace the medians along Park Avenue from 57th-65th streets. The sculptures, made from metal and fiber glass, range from 3 to 25 feet in height and add a bright spray of color to this concrete city. This playwright-turned-artist has combined the strength of the steel buildings that surround the sculptures with the beauty of nature in an artistic message that spells I Love NY. For more images of Ryman's rosy creations click here. A girl in Dhaka celebrates as Bangladesh marks 38 years of independence from Pakistan. What if it Rained Roses? Indian Army chief Gen Deepak Kapoor is showered with rose petals from a helicopter during Army Day celebrations in Delhi. Yes, I know the April theme day is about water, not roses :) But this picture describes very well the weather in Toulouse right now : Roses start blooming but rains nonstop pouring. There was sunshine in between and the rainbow shows up as the queen. A Bulgarian villager gathers roses in the early morning. 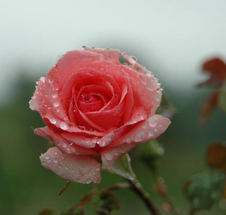 Bulgaria is a major producer of rose oil, a key ingredient in perfume. Explanation: This gorgeous celestial vista is centered on one of the Milky Way's own planetary nebulae, M57, the famous Ring Nebula. The wide view is a composite of three exposures; one to record the details of the inner roughly one light-year span of the familiar nebula, one to record the surprisingly intricate but faint outer rings of glowing hydrogen gas, and one to pick up the rich assortment of distant background galaxies. By chance, one of the background galaxies, IC 1296 at the upper left, is close enough to show its barred, spiral structure making an attractive visual comparison with M57. Interestingly, though IC 1296 is 200 million light-years away compared to only 2 thousand light-years for M57, a faint ring is also apparent around the outer reaches of the distant spiral galaxy. One of the most unusual roses is the Chinese Wingthorn rose (R. sericea ptericantha). It's most remarkable for its elongated and most colorful thorns. The effect is best viewed with a light source behind the thorns, which come in red and orange varieties. The bloom is quite modest, so the novelty is in the thorns. One can be seen at the Uncommon Rose®. Explanation:Would the Rosette Nebula by any other name look as sweet? The bland New General Catalog designation of NGC 2237 doesn't appear to diminish the appearance of the this flowery emission nebula. Inside the nebula lies an open cluster of bright young stars designated NGC 2244. These stars formed about four million years ago from the nebular material and their stellar winds are clearing a hole in the nebula's center, insulated by a layer of dust and hot gas. Ultraviolet light from the hot cluster stars causes the surrounding nebula to glow. The Rosette Nebula spans about 100 light-years across, lies about 5000 light-years away, and can be seen with a small telescope towards the constellation of Monoceros. The world's first blue rose developed by Japanese brewer Suntory is displayed during a press conference in Tokyo. In 1990, Suntory purchased a 15% share and formed a joint venture with Australian biotechnology Calgene Pacific Pty Ltd. to develop various new biotechnological products. Underway is the first combined project to create a legendary blue rose. By Jos Bijman Calgene Pacific (CP) was established in Melbourne, Australia, in 1986. Shareholders include DNA Plant Technology (USA), Fides (The Netherlands), and Suntory (Japan). Last year CP acquired its Dutch competitor Florigene. Identification, isolation and transferring of genes responsible for colors are the main focus of research at CP. In 1991, it isolated the key genes responsible for the colors blue and red. CP's main research project is the development of blue flowers, particularly a blue rose. Of the ten most popular flowers only the Freesia has blue varieties. CP expects that blue flowers would command a market share close to that of red if they were freely available. Blue transgenic petunia were reported in 1992. Blue carnations and chrysanthemum are being tested this year, while the blue rose is expected in 1995. In Japan, three large breweries, Kirin, Sapporo and Suntory, have invested in plant biotechnology. Because they are afraid that a negative image of a genetically modified food crop would be associated with other edible products of their companies, they focus in particular on ornamental crops. Kirin Brewery is involved in micropropagation and flower export through its Dutch subsidiary Hiljo in Amsterdam. Kirin also owns Fides, the largest Dutch chrysanthemum breeding company. Kirin itself has developed new breeds of ornamental chrysanthemum, using tissue culture and cell engineering techniques. Sapporo is involved in the cultivation of orchid plants, using cloning techniques, including tissue culture. Suntory has developed a virus resistant transgenic petunia. Suntory is shareholder of Calgene Pacific. Suntory and Calgene Pacific have set up a joint venture named International Flower Development (IFD). The aim of this joint venture is to apply genetic engineering technology to produce blue flowers, particularly blue roses. Suntory holds the marketing rights for Japan, CP for Australia, North America and Europe. IFD has applied for world patent on several techniques to control flower color in plants. If you run across any remarkable rose pictures or articles to share you can send them to the Webmaster for possible inclusion on this web page. Email your articles and/or pictures to the . To observe copyright laws also send the source and URL of your story or picture.